The Derby shoe, also known as the Gibson or the blucher, was originally intended as a sporting and hunting boot circa the 1850’s. At the turn of the 20th century, Derbies became accepted as appropriate footwear for the town. Derbies are often miscategorized as oxfords, as their shape is very similar and their differences are very slight. Though not obvious upon first glance, the difference lies in the placing of the face. The Derby shoe has the facing stitched on top of the vamp; with an oxford, tabs are sewn under the vamp. This construction, called “open lacing,” allows for a wider fit than is typical with an oxford. 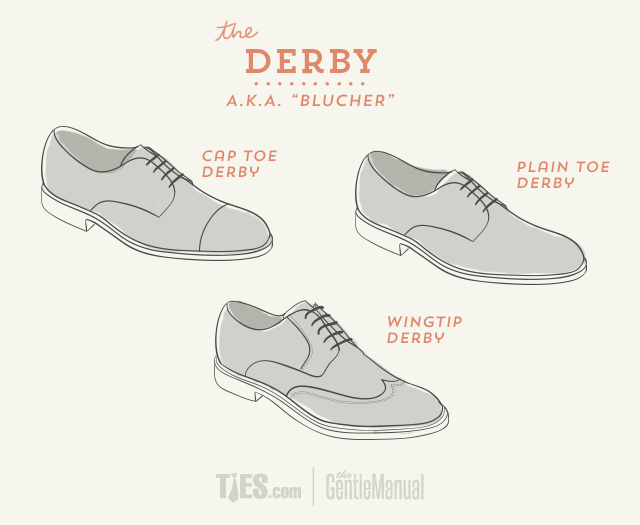 For many, this makes the Derby a more comfortable shoe. This simple detail has kept the derby reminiscent of its sporting roots, for which reason it is received as a less formal version of the Oxford.